In Indochina, in joint partnership with local farming groups, I.O.D. produces agricultural products using mainly organic farming techniques and exports the raw produce for sale and processing. In partnerships with overseas marketers of agricultural produce and using its vast, rich farmland holdings in all regions, I.O.D. also undertakes complete agricultural production projects by integrating local production, processing, handling and export. Please contact us if you are interested in farming in Indochina. We will assist you. Around the world, with a sudden demand for Chinese herbal medicine, which is gentle on the body, it is becoming increasingly difficult to obtain supplies of the raw materials. Demand in China itself, the great producer of Chinese medicinal herbs, is expanding rapidly and there are reports that this traditional exporter will be banning exports of the raw materials, and manufacturers of Chinese herbal medicines in all countries could possibly be directly hit by difficulty in securing supplies of raw materials. For this reason, we are looking for places to grow them in an effort to evade such risk. A variety of types of Chinese medicinal herbs are suited to production and cultivation in Laos, which could possibly become a major production base. For this reason I.O.D. Farm is planning to grow Chinese medicinal herbs. As for the herbs themselves, there are a great many different types and those listed below are but a few examples. 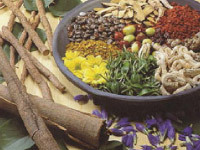 In this sense as well the demand for Chinese medicinal herbs is spreading worldwide. Camellia oil is obtained from camellia seeds. Camellias belong to the Thaeacae family and can be found over a wide area, from Eurasia to the African continent, and from the Australian continent to the South American continent. In recent years, with the rising interest in natural things, the excellent properties and characteristics of natural camellia oil have been attracting renewed attention. Usage is being extended to a variety of fields such as a base for soaps and skin care products and as an ingredient in food, and it is increasingly being spotlighted. 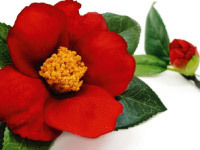 The principal uses of Camellia oil are in hair care, skincare, oil massage, for rust proofing blades and oiling wooden objects, and as an edible gourmet cooking oil, healthy edible oil for the elderly, lubricating oil for machinery and so on. Currently world demand is increasing and there is a rush to increase production. Pepper is a spice, medicinal product and food that has been produced in South East Asia for a long time, and it is said to have originated in the Indochina Peninsula. During the time of the British Empire and colonization of India and Indo China by Britain, European merchants took the pepper food culture to Europe and incorporated pepper into European food culture as a valuable spice. And it was for this wonderful spice that European countries pushed so forcefully into South East Asia with their powerful colonization strategies. 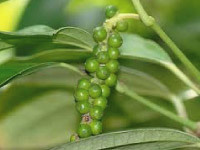 Current well-known pepper growing nations include India, Brazil, Indonesia, Sri Lanka, Thailand, Cambodia, Myanmar and Laos. There are various types of pepper, white pepper, black pepper and green pepper and depending on the purpose of using pepper in cooking, different types of pepper are used. Pepper from Thailand, Laos and Cambodia, which chefs around the world all agree has the best flavor in the world, is fruity, aromatic and has large corns, and enhances the flavor of meat, seafood and vegetable dishes, whether Japanese, Continental, Eastern or Western and it charms people around the world. Pepper takes from 5 to 7 years from the planting of seedlings to harvest. For this reason, for small-capital investment farmers it generates little revenue and they do not grow much of it. However, once harvesting commences, pepper can be harvested for 30 years, and it becomes a very high-earning farm product. Cambodian pepper tastes so good because of two important things, the pure agricultural chemical-free soil, which has not been farmed for a long time, and the climate suit it. I.O.D. Laos Farm has soil that is even better than the Cambodian soil. We have about 168ha of organic, chemical-free soil that is just right for growing pepper. How about growing the finest smelling black pepper with us? How about growing black pepper on I.O.D. Farm as a side business? You can use I.O.D. 's farmland. I.O.D. will take care of the growing, harvesting, sales and management. A 5-year plan and from 10ha to 15ha will generate a considerable income. You can also make it your main business. Contact us for more details, or to discuss this further. Wasabi is a type of perennial brassica and is a condiment used in Japanese cuisine for the fiery way it stimulates the nose. Historically it is recorded as having been used since the Heian Period and it is thought that wasabi has long been a popular ingredient. From the Edo Period, people started eating sashimi and grated wasabi dampens the raw fishy smell, enhances the flavor of the fish, and helps to prevent food poisoning, so it has long been loved and used by ordinary people. Conventionally, wasabi is known to have the following effects. In recent years studies are being done to discover other new possible functions. 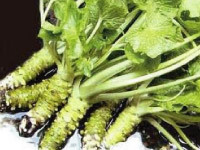 In this way, wasabi, which is a traditional Japanese condiment, has not only been used as a spice but has also become established as a food that is effective in promoting and maintaining good health. Also, seen from the perspective of food hygiene in these days when food imports are rapidly increasing, advances are being made in the practical use of wasabi as an anti-bacterial agent and preservative, and it can be said to be a natural substance of which further expansion in application can be expected in the future. Recently, in such places as Europe, America, South East Asia and Australia, there has been a boom in Japanese food, with Japanese restaurants opening up all over the place. This has had the effect of making wasabi popular overseas as well. For this reason recently in particular the overseas demand for wasabi is rising. However, production volume is small and production centers are few in number, so the balance of supply and demand is being destroyed. Over the next several years, the demand from overseas will probably increase several times. Currently, I.O.D. Farm is experimenting with the cultivation of wasabi in mountain streams on the Bolaven Plateau in Laos, where water is plentiful and the altitude is 1500m above sea level. So far, it is growing steadily and experimental cultivation will soon come to an end. From next year, we plan to move on to cultivation in earnest. It will be a while yet before the product can be shipped out, but we plan to be able to provide shipments at inexpensive unit prices. We will also provide land for growing wasabi. How about growing wasabi with us? Please contact us if you would like to discuss this further. We will give you advice. 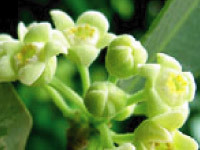 The king of all fragrances in the world Agarwood oil is obtained from Aquilaria trees. This tree can only be grown in Thailand, Laos and Cambodia and is very valuable tree. The raw oil is used to perfume a variety of cosmetic products (perfumes, shampoo, soap, aroma oils, body oils, medicine and incense). It has been used around the world from ancient times in many ways, including directly as fragrant wood. After seedlings are planted it takes at least 20 years before these Aquilaria trees can be used for oil or as the fragrant Agarwood. For enterprises, it is a difficult venture to make into a business. We are growing these trees at the Chanthaburi I.O.D. Agarwood Farm and processing plant in Thailand. This very valuable tree gives us wonderfully fragrant oil. We have also developed a way of making a health food by making a powder from the new aquilaria buds and new leaves that appear during the oil making process. These leaves are extremely bitter, but the medicinal action of the raw leaves is already known in Chinese herbal medicine. In developing the product, clinical trials and testing carried out over a long period of time at a university have shown that it is a wonderful product. We are looking for people to take up sales licenses in the following areas. Contact I.O.D. for further details. In Chanthaburi in Thailand, I.O.D. Farm is growing Aquilaria trees on 18ha for use in aroma oil. Trees have to grow for at least 20 years before the Agarwood oil, the best fragrance in the world can be harvested, and for this reason it is a very valuable raw ingredient of aroma oils. Of course it is also used in various ways in a variety of cosmetic products and this enables this wonderful fragrance to reach people around the world. With expanded demand for raw fragrant wood, in order to extend production, I.O.D. Farm is planning to establish plantations in the cool environment of the Bolaven Plateau in southern Laos. If all goes well, we are planning to plant an area of 150ha. When results come out, we will commence cultivation immediately. ① Purchase aromatic tree related materials produced by I.O.D. on its own farms. ② Through I.O.D., contract local farms to cultivate and produce the product. ③ Direct management by the company of cultivation and production on land provided by I.O.D. Please contact I.O.D. for further details. 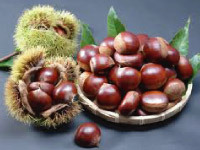 Chestnuts grow in temperate regions and are widespread throughout Asia. From 3 to 4 years is required for trees to grow big enough for the nuts to be harvested. Chestnut trees are not so difficult to grow. However, if the temperature drops too low, they will suffer from frost damage and die in about 2 years. So that is the main thing to be careful of. Apart from that is the fact that delicious fruit attracts bugs. The main pests that attack chestnuts are the chestnut weevil (Curculio sikkimensis) and the nut fruit moth (Cydia kurokoi). The way to eradicate these pests is to fumigate the chestnuts with methyl fume. We also recommend that they be kept in cold storage. In planting chestnut seedlings, it is important to leave rather a large gap between trees, about 5 to 7 meters. Another good idea is to mix different kinds of chestnuts and not fill the plantation with a single species. Plant a selection of Kinka, Omine, Tanzawa, Rihei, Tsukuba and other varieties. The above cultivars are fantastic. A very important thing in growing chestnuts is the pruning of branches. Managing the harvesting, fumigation and pruning operations is hard work, and since ladders are used, there are more injuries. Using super- low-stature tree cultivation methods, yield can be doubled on a small land area and this technology is very effective for work efficiency. Secondly important is the soil. It must be full of minerals. And sunshine must spill over everywhere. Light must penetrate everywhere. Places fulfilling these 3 points are essential for chestnut growing. If the chestnuts are delicious, moist and large, confectioners around the world will come looking for them. The next thing is stable supply. Wonderful chestnuts can be grown in the highlands of Laos and Myanmar. We contract out the cultivation on the Bolaven Plateau. This plateau has a cool climate with a minimum temperature of 10℃ and a maximum of 30 ℃, and vegetables can be grown year round. Arabica coffee here is grown organically, the coffee is smooth with a quality fragrance. The Vietnamese coffee well known in Japan is in many cases made from beans that originated from this Bolaven Plateau. I have heard that it is being sold to Starbucks for use in its menu. I.O.D. Farm is looking for people who as a side business want to grow beans that are highly popular for their fragrance in the plateau region of southern Laos, which is a valuable growing region for Arabica coffee. I.O.D. Farm will take care of the growing, harvesting and sales. And of course the investor can play a direct part in this. For the time being our target is to plant an area of 10ha, and we will help you to turn it into a side business that will become a sound source of revenue. 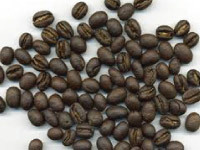 The coffee beans produced are highly popular and selling them will be no problem at all. Of course, we will also open up and provide our farmland to enterprises wanting to manage and operate coffee plantations on a larger scale. Please contact us with your enquiries and to discuss this further. Looking at production trends of natural rubber worldwide, the total yield from plantations in Thailand, Indonesia and Malaysia accounts for 70% of the whole. Currently, motor vehicle manufacturers use 1.24 million tons annually, and as production increases, the demand for natural rubber will also rise and there is a potential for production increases in natural rubber producing countries. The total usage tonnage of natural rubber is 13, 800, 000 tons, but the demand from Asia, in particular China and India, for natural rubber is expected to increase several fold in future and it is attracting attention as a cash crop. Laos is a neighboring country of Thailand and has a similar climatic environment. Farmland and workers are easy to come by and put into a business plan, and the rubber that has been produced can be sold on good terms in the Thai market. I.O.D. 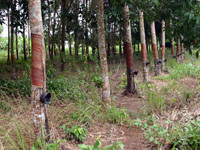 's rubber production areas are in two regions. In Chanthaburi Province and Rayong Province in southern Thailand we produce rubber mainly for the Japanese market, and natural rubber from Mae Sot Province and Mae Hong Son Province in the north is mainly sent directly to China and Vietnam. The other production base is Laos. The places are Champasak, Pakse, and Paksong in the south where the soil is really good and these are the best areas for agriculture. The farmland spanning both countries is about 80 ha in Thailand and 500hs in Laos, but there is about another 1500ha in Laos that is being turned into as yet unused farmland. Future rubber harvesting will commence in the 7th year. I.O.D. offers 3 purchasing options for companies wanting to purchase the raw rubber. ① Purchase natural rubber produced by I.O.D. on its own farms. ②Through I.O.D., contract local farms to cultivate and produce the product. Endemic to areas from Northern Africa to the Arabian Peninsula, some people say that the original species came from the Mediterranean Sea area. The name Aloe comes from the Arabic word 'alloeh', which means bitter. When leaves of the aloe Vera are cut, they exude a sticky juice. Only the flesh of aloe Vera is used, but unless you eat the slime, eating it at all would be meaningless. Aloe Vera is best raw. The flesh inside is transparent and very beautiful. This contains more than 70 natural constituents. One of these, mucoid (a poly-saccharide) is what makes it sticky. Hyaluronic acid is also a kind of mucoid and these sticky components are said to be extremely good for you whether eaten or spread on the skin. Aloe Vera contains the most of these substances. The components of aloe Vera are made into a wide variety of commercial products. Aloe juice, aloe yogurt, aloe-based cosmetics, aloe food products, aloe sashimi, hair tonic and so on are all very popular in China, Korea, Taiwan and countries in the Middle East. I.O.D. 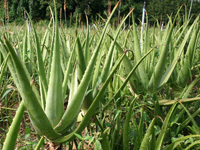 Shinoda Farm cultivates aloe Vera in southern Thailand and southern Laos. The area under planting and cultivation is approximately 150ha, and in farm area it is the largest production base in Indochina. I.O.D. offers 3 purchasing options for companies wanting to purchase the product. ① Purchase aloe Vera grown by I.O.D. on its own farms. How about growing garlic in Thailand, Myanmar or Laos, the home of garlic production? Garlic is of course produced all around the world, but there are only small areas left where the farmland has rich soil, full of minerals. These areas are in Indochina, in Thailand, Myanmar, Laos and Cambodia. 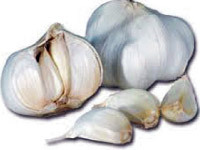 Historically, garlic was first grown and produced in Egypt, and pictures of garlic often appear in historical resources recording the history of thousands of years ago. In Japan, it is said to have come in from Korea during the Heian Period and there are many records in books about it being treasured as a medicine for people of noble birth. It is said to have become popular for use in food during the Edo Period. Currently, garlic grown in Aomori Prefecture is plump and popular, and with regard to the unit price, a single garlic weighing 40 - 50 g currently retails for about ￥300, which is very expensive. Garlic is in demand around the world for use in food, health food and medicine. So there is a very great demand and production cannot keep up with it. Japan currently imports a massive volume of garlic from China. There is increasing demand from within China as well, and it is possible that China will have more trouble filling export orders as years go by and even now it tends to be in short supply and Japanese food makers are worrying over sourcing garlic from countries other than China. I.O.D. has joint garlic growing ventures in Thailand, Myanmar and Laos. Organically grown, a delicious good quality product is being produced. We want to export to world markets. We will send samples with actual expenses including the postage on a parcel to food manufacturers who are interested in buying it. I.O.D. Farm also has a lot of farmland available for usage, and we will undertake production ourselves as a sub-contractor and can arrange production contracts with other farmers. Please send us your enquiries about these schemes as well. Ginger is the rhizome of the plant Zingiber officinale and is said to be native to tropical Asia, from India, Thailand, Laos, and Myanmar through to Malaysia. Ginger has long been used in Chinese herbal medicine for its medicinal properties. 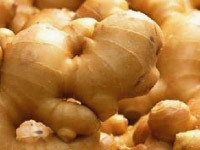 The raw tubers (ginger root) is effective for a healthy stomach, to remove toxins, reduce fever, clear the nose, suppress coughing, stop nausea and so on. Dried ginger (dried after steaming) stimulates the body's metabolism, has good warming properties and helps to relieve colds, stomach aches and diarrhea as well as being effective against feeling the cold and bedwetting. The heat in ginger comes from zingerone crystals and the oily shogaol and zingiberene, both of which are essential oils. These constituents help to keep the stomach healthy by promoting the secretion of stomach juices, promoting digestion and appetite. It is also used for sweating and fevers, to stop coughs, reduce immflammation and swelling, and for warming the body. In particular, Zingerone has powerful antibacterial properties against the typhoid and cholera bacteria. It also effectively kills the Anisakis larvae. It is said to have arrived in Japan from China (the old country of Wu 222 - 280). And is mentioned in such old tomes as the Record of Japan in the History of Wei and the Kojiki, where it is called 'hajikami'. Ginger is classed as large, medium or small, and within each of the three groups there are different cultivars, but property-wise there is very little difference. The Large Ginger Group was introduced at the beginning of the Meiji era as Canton ginger and is grown in Kyushu, Shikoku and warm parts of Kansai and Kanto. These late harvested cultivars are tall, growing to 70 - 10℃m, the bases of leaf stems are pale and there are not many offshoots. The stalks above ground number around 20, and from 800g to 1kg of rhizomes can be harvested from a single plant, which is a good yield. The flesh is soft in texture and this ginger is a bit mild, but it gets hotter as it matures, however it does not store well. The ginger cultivated within Kagoshima Prefecture is large ginger. The Medium Ginger Group is used for with its leaves still attached and as blanched ginger. It developed around the Kansai area and has spread throughout the rest of the country. It is middle to late harvested cultivar, has fat rhizomes and grows robustly. Rhizome yield is 600g. It grows to about 50cm in height and has numerous offshoots, sending out about 50 shoots. The Small Ginger Group is largely used for blanching and is produced mainly in the Kanto area. It is ready for harvesting early to mid-season, with thin stems, numbering about 40. Rhizomes are thin and fibrous. They are not very juicy and are very hot. Yield is about 500g. Where temperature conditions for growing are concerned, ginger is grown from the hot, wet tropics to temperate areas. In mainland Kagoshima Prefecture, it dies off during the winter cold. Rhizomes do not become dormant and when the temperature rises above 18 ℃, they begin to sprout and send out shoots. Temperatures between 25 and 30 ℃ are best for growing and growth will stop if the temperature falls below around 15 ℃. Ginger will rot at temperatures of 10 ℃ or less. Where soil conditions are concerned, sandy and clay soils are all right, but deep, well-draining, moisture-retentive soils are best. The roots require a growing bed of at least 2℃m so the ground must be tilled deeply. Where water is concerned, ginger dislikes arid conditions, and likes humidity, so if there is insufficient moisture in the soil it will stop fattening. For this reason, irrigation is very effective on ginger crops. Where exposure to sunlight is concerned, during the initial stages of growth, it likes the shade. During the peak growth stage it requires a lot of sunshine. Repetitive use of the same fields can cause diseases from continuous cropping and yield will fall. I.O.D. Farms are producing organically grown local ginger on farmland that matches these conditions in Thailand and Laos. Enough spare fields remain uncultivated, so if you would like to use the farmland, we will supply it. We will also sell and export the ginger grown on these farms. If you would like a sample, we will send it to you with actual expenses including the postage on a parcel. Sub-contracting by I.O.D. and out-sourced production are also possible. Just give us a call. Konjac yams are grown on the Bolaven Plateau at a height of about 1100 meters above sea level, and located in the northwest part of Champasak Province in Southern Laos. The climate is comparatively cooler than other regions with a minimum temperature of 10℃ and maximum of 30 ℃, so it has the advantage of being able to grow the konjac yam regardless of whether it is the rainy season or the dry season, the soil is very good, organic fertilizer is easily obtained, there is plenty of farmland and yields are also nothing to complain about. The only thing is that this is our first experiment with growing the konjac yam and we are looking forward to the results. We are also growing taro, yams and sweet potatoes in the same area and there don't seem to be any problems. Konjac yam becomes the raw ingredient for a variety of konjac products and has enjoyed a rapid growth in demand in recent years as a healthy food and a diet food, and there is a shortage of supply of the raw product. With expectations of the development of new consumer markets in China, Taiwan, South East Asia, Europe and America, hopes are pinned on future production of the raw product. On I.O.D. Farms the konjac yam will be grown in the Bolaven Plateau in southern Laos, 2 places in Thailand, Lop Buri Province and Tak Province. The scheduled farm area to be planted is 150ha in total. If cultivation goes steadily without a hitch, this will be expanded to 300ha. We also have our own processing plant nearby and we export it to the rest of the world as raw product for use in processed konjac products. 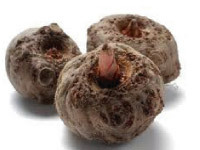 Konjac yams can be harvested 2 years after planting. I.O.D. offers 3 purchasing options for companies wanting to purchase the raw product. ①Purchase konjac yams grown by I.O.D. on its own farms.